Watkins Glen, NY — Having kicked off the racing season with a run to the podium in the Liqui-Moly Bathurst 12-Hour, Australian racer David Calvert-Jones will add another big race to his 2014 campaign this weekend as he is set to contest Sunday’s Sahlen’s Six Hours of the Glen in IMSA TUDOR United SportsCar Championship competition with Muehlner Motorsports. The Muehlner Motorsports line up for the No. 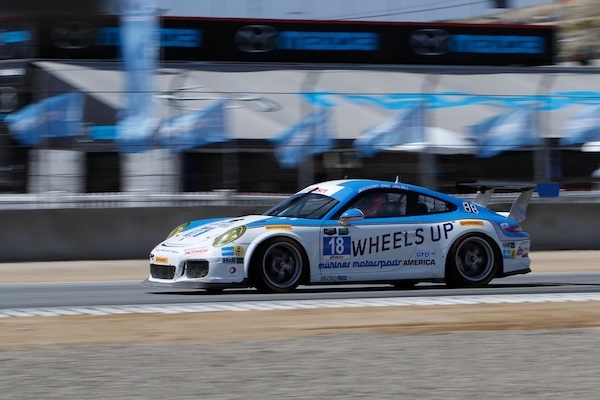 18 Wheels Up Porsche GT America will see Calvert-Jones sharing the driving duties with experienced New England-based racer Peter Ludwig and another fellow GT3 Cup USA competitor Patrick Otto-Madson. Calvert-Jones will have a busy weekend as he is set to also race in both rounds of IMSA Porsche GT3 Cup USA by Yokohama competition with Competition Motorsports in the No. 12 Wheels Up Porsche 911 GT3. This entry was posted in News on June 28, 2014 by admin.